Aubrey Ronald Medhurst was born in Sidcup (Kent) in 1909. In 1933 he married Elsie Florence Greenslade in London. In 1936 they were living in Lewisham. Her family was originally from Deptford, though she’d been born in Balderton (Smith St). During the 2nd World War Aubrey was a Craftsman (Private) in the Royal Electrical and Mechanical Engineers. 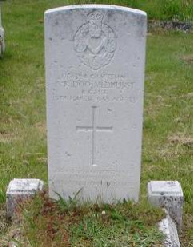 He died in Cheshire in March 1943 (aged 33) but was buried in Camberwell, Kent. Elsie was living at Ideal Cottages, Claypole (site of the Workhouse, now Gretton Close).